Known as “Chainsaw Al,’’ Mr. Dunlap oversaw the transformation of several companies. WASHINGTON — Wherever Albert J. Dunlap went, success seemed to follow. A hired-gun CEO, he presided over nearly a dozen corporations, including a disposable-cup company, ketchup bottle manufacturer, and toilet-paper giant, and grew profits while firing thousands of employees in the name of efficiency and cutting costs. An unabashed proponent of downsizing, he became known as ‘‘Chainsaw Al,’’ ‘‘the Shredder,’’ and ‘‘Rambo in Pinstripes,’’ while his own name entered the corporate lexicon as a verb — ‘‘to Dunlap’’ — for turning a wayward company into a high-flying success. Yet Mr. Dunlap, who was 81 when he died Jan. 25 at his home in Ocala, Fla., later faced allegations of smoke-and-mirrors accounting that led to his 1998 ouster from Sunbeam, a small-appliance company, and to news reports that unearthed similar fraud allegations earlier in his career. He never faced criminal charges. But in 2002, he agreed to pay the Securities and Exchange Commission $500,000 to settle the Sunbeam allegations and was barred from serving as an officer or director of a public company. Mr. Dunlap denied wrongdoing and insisted that he was nothing less than a corporate doctor, saving ‘‘dying’’ companies that were overburdened by debt. While he generally disdained charitable giving as an executive, canceling $3 million in charity pledges while running Scott Paper, he refashioned himself in recent years as a leading Florida philanthropist, donating more than $40 million to Florida State University. Still, his reputation as a cutthroat corporate leader proved hard to shake. Since being ousted from Sunbeam, he was cited in articles such as a Time magazine list of ‘‘Top 10 Worst Bosses’’ and a Fast Company story headlined ‘‘Is Your Boss a Psychopath?’’ For a 2015 GQ feature —‘‘Your Boss Actually Is a Psycho’’ — writer Jon Ronson visited Mr. Dunlap’s estate in Florida, asking him whether he might not be a psychopath. Ronson based his questions on a list of traits assembled by psychologist Robert Hare. Mr. Dunlap, he wrote, redefined certain psychopathic traits (impulsivity, manipulative behavior) as ‘‘leadership positives’’ and wrote off his Sunbeam years as ‘‘a footnote’’ in his career. 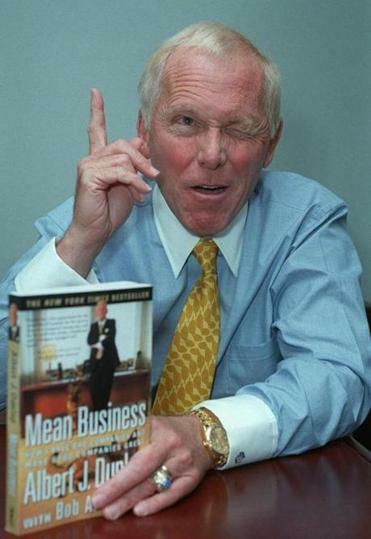 As Mr. Dunlap told it, in frequent interviews and a best-selling 1996 manifesto, ‘‘Mean Business,’’ his was an all-American success story, in which ‘‘a nothing kid from the slums of Hoboken, N.J.,’’ rose to graduate from the Military Academy in West Point and claw his way to the heights of American business. That image of heroic, self-made success was undermined by accounts from his sister, Denise, who told Businessweek that she and her brother had ‘‘a very comfortable childhood,’’ and from divorce filings in which his first wife, Gwyn Donnelly, alleged he had threatened her with guns and a Bowie knife. According to ‘‘Chainsaw,’’ Mr. Dunlap could also be cruel to co-workers; on one occasion, he threw a chair at Sunbeam’s human resources chief. On Wall Street, however, Mr. Dunlap was long viewed as a hero who could do no wrong. Under his leadership in the 1980s, the cup-maker Lily-Tulip increased its stock price by more than 900 percent, from $1.77 to $18.55, according to ‘‘Mean Business.’’ He was later credited with tripling the stock price of Scott Paper, which was struggling with $2.5 billion in debt when he was named CEO in 1994. In both cases, the growth was fueled by massive cuts. Mr. Dunlap eliminated about half the staff of Lily-Tulip and about 11,000 jobs, or one-third of the workforce, at Scott Paper. Indeed, two days after Mr. Dunlap joined Sunbeam, in July 1996, he told analysts in a conference call, ‘‘I love every dollar like a brother,’’ and declared that he ‘‘would have hung’’ the previous management team for incompetency. His rise was halted suddenly in 1998, amid news reports that he had inflated sales figures through tactics such as buy and hold, in which products such as outdoor grills were ‘‘sold’’ in the winter but not paid for until spring. Mr. Dunlap effectively retired from business after his ouster at Sunbeam, although he continued to maintain that he had done nothing wrong and embarked on an international speaking tour with General Norman Schwarzkopf and former Soviet leader Mikhail Gorbachev. The subject was leadership.